Please join members of the GVHS Instructional Leadership Team for voluntary training and work sessions. In each session you will be provided with some background knowledge or tools to consider and then given plenty of time to work on creating content for the new school year. It is a fantastic time to collaborate and get feedback from other people in the room while picking up some new skills and getting paid for it. Bring your Chromebook or anything else you need to work. All sessions will take place in the GVHS Library. You are welcome to attend the same session more than once. If you have any questions please contact Stacey Cool at scool@muhsd.org. Many people have heard of Kahoot,but not Quizizz,. Quizizz is like Kahoot with a few minor differences that can have a large impact. Both are quizzing games for students. Both will save a file of results for you. Both allow students to sign in with a nickname and allow you to boot a student out of a game. Both will reward students for answering questions faster. Both allow for you to borrow and modify questions from a gallery of quizzes that other teachers have made. Both show students a leaderboard (which you can turn off) to provide fun competition. 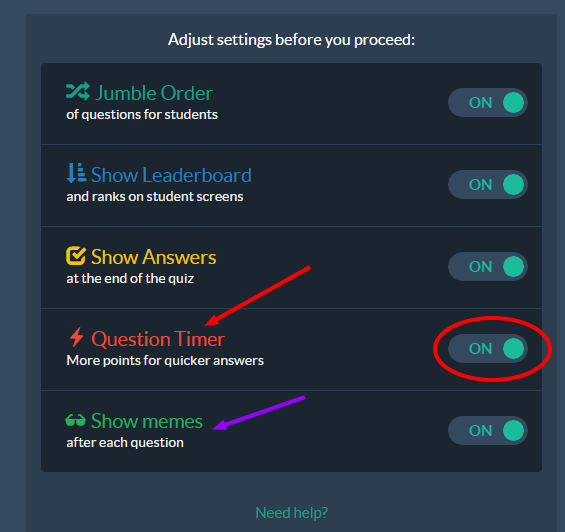 The big difference with Quizizz is that you can turn off the feature of giving more points for a faster answer. This allows students think time. Students are less likely to give up and "button mash" to try and get more points. With both Quizizz and Kahoot participants join with a code. However with students can work at their own pace on Quizizz and with Kahoot you have to wait until all students join before starting. Another key difference in game-play is Kahoot displays the questions on the screen and with Quizizz the questions display on the student device. Quizizz also gives a little more student feedback in the presence of memes and allowing students to review the answers at the end. To play a demo Kahoot, go to this link and type in the code provided. To play a demo Quizizz, go to the following link and type in the code Stacey provides you. On slides 3 through 5 there are some different websites and ideas for CFUs that are not mentioned elsewhere on this webpage. Go Formative - you can do live CFUs where you can see what students are thinking immediately. It will auto-grade multiple choice and short-answer. It also has a drawing component for "showing your work." Can make different classes that students can join with a code. Data can be downloaded to spreadsheet. As of now you cannot return feedback to students, but that is a feature that they are trying to build in. You can share formatives with other teachers. What is also interesting about Go Formative is that you can take any assignment, even something that is a PDF and convert it into a document that students can write on. Poll Everywhere is a great tool that was developed for business that educators have co-opted. ILT has a tutorial on Poll Everywhere that can be found here. Socrative is another popular way to check for understanding that has been around for many years with expanding features. They have different types of CFUs (polls, exit slips, games) and also provide ways for teachers to track data.